Considering that today is the 4th of July holiday, I thought that it would be nice to review a game with which you could relax. 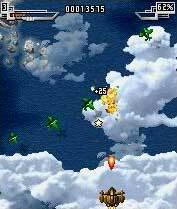 A few days ago I came across Sky Force which has been one of the most popular PocketPC games and was the winner of the 2005 Handango Champions Awards as “Best Application for Play”. 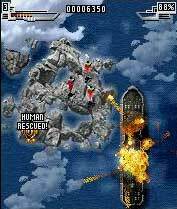 To my delight, Sky Force has now been released for our Treo. Sky Force is a completely addictive arcade plane-ship shooter with 3D interactive objects (such as planes, bombers, boats, artillery, aircraft carriers, turrets), fantastic graphics, awesome special effects and soundtrack. In short, Sky Force is about as perfect fun as games of this type come. Sky Force offers complete one handed play and full 5Way button support. There are 7 levels, 3 difficulty modes, 3 types of ‘ships’, tons of enemies to shoot and good old Earth to save. As you progress in the game you’ll be collecting stars for bonus points, shield power and additional weapons all while making sure that you don’t get hit by too much incoming enemy fire and destroy as many of their units as possible. 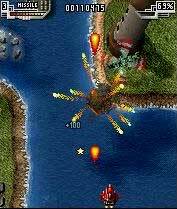 There’s no doubt that arcade shooters are among my favourite game categories (they bring out the kid in me…) with other titles such as Zap!2016 and Hellfire high on my list while Warfare Inc. is probably at the top of it. However, overall it is disappointing that there are so few good titles available and also some more variety such as tanks and armoured cars for example (although I hear that a couple are in development). In this light, it’s been fantastic to find such an amazingly good game as Sky Force and (leaving the best for last) at $9.98 it’s an absolute bargain to boot! 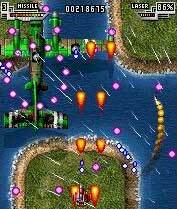 I have no doubt that now that Sky Force is available for our Treo it will become one of the single most popular games for it. While this game does look incredible, it doesn't look significantly better than 1942, 1943, xevious, or any of the tons of other games of that sort for the NES and SNES. So what I'm curious about is why there is never any mention of the NES and SNES emulators available for the treo? They work very well, and if you own the cartridges, having the ROMs should be legal, though I recognize this is a specific interpretation. NES emulation works very well on the Treo, but SNES does not. Between lack of dynamic memory and simply too slow a processor, it just doesn't work. Sure, you can overclock your Treo and get the unlimited dynamic memory hack (which combined will set you back $20) so it *sort of* works (not to mention buggy emulators, etc), but it certainly is a long way from "works very well". What NES emulator do any of you like best? I wasn't even aware they were available...I've still got my old carts, so (as far as I'm concerned), I'll be legal with the ROMs. Playing Super Tecmo Bowl on my Treo would flat-out rock! Just brought the SkyForce game and downloaded it. All it seems to do is reset my 650 everytime I attempt to play. Whats up with that? Finally got the game to work and its worth the wait. Great graphics and action. Ideal diversion before, after and during meetings! I have the Treo 700 and played with the NES emulator on the 650. Is there a way I can get this on my 700?